Respiratory infections are the main causes for hospitalization in children and a common reason for the initiation of antibiotic treatment. Rapid antigen detection tests and point-of-care mPCR-based assays provide a fast detection of viral pathogens. Nonetheless, the prescription rate of antibiotics for respiratory infections is exceedingly high. In particular, human metapneumovirus (hMPV) infections frequently cause antibiotic treatment. Children hospitalized in our clinic with an acute respiratory infection between January 2008 and January 2013 were included in the present study. Data of 3799 children were analyzed retrospectively for clinical symptoms, laboratory findings, and antibiotic and inhalation treatment. We performed an in-house m-RT-PCR-ELISA method for pathogen detection. Pathogen detection was possible in 2464 patients. In 6.3%, hMPV and, in 24.0%, RSV were detected. Patients positively tested for hMPV received inhalation therapy in 62.9%; patients positive for RSV in 73.8%. Patients positive for hMPV were treated with antibiotics in 62.3%. Patients with RSV infection received antibiotic treatment in 44.4%; all others in 43.5%. Notably, a positive result in RSV-RADT was associated with reduced number of antibiotic treatment. hMPV infections inherit a two times higher probability of antibiotic treatment. 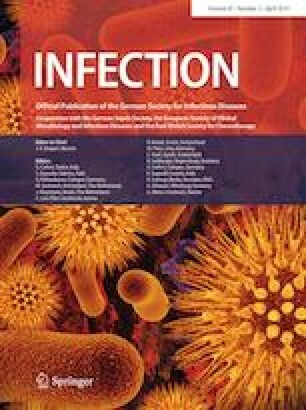 There was no significant difference in laboratory findings or body temperature between hMPV infection and infections caused by other pathogens. Clinical symptoms seem not to differ from those in RSV illness. Nonetheless, RSV infections triggered significantly lower antibiotic prescription rates. A considerate application of a POC-mPCR for patients with RSV-like symptoms and age of 1 year and older with a negative RSV-RADT might lead to higher detection rates of hMPV and a reduction in prescription of antibiotics.